Peak half and full marathon training time is approaching us once again! It is almost time to dust off our outdoor running gear and hit the pavement/asphalt/track/trail! Every year I tend to bunker down during the winter and opt to exercise inside. I know that I am not alone in making this decision. As soon as temperatures drop below freezing, gyms start to reach capacity, it becomes hard to find a treadmill or elliptical, and Zumba, Pilates, and yoga studios become even busier than normal! As soon as the thermometer reaches 50°F, I (along with the rest of the winter hibernators) am ready to get back outside! My spring fever has inspired me to sign-up for two half marathons. I trained and completed my first half marathon in 2013 and my second half marathon in 2014. 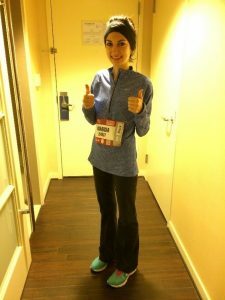 Even though I successfully completed both half marathons, I look back on my training experiences very differently. During my first training experience, I used a training program that one of my avid runner friends recommended. The plan was very “run” heavy and did not incorporate many cross-training opportunities. Nevertheless, I followed the plan religiously; my nervousness regarding race day motivated me to run almost every day without fail. Unfortunately, I started to experience intense hip and back pain three weeks prior to the race. My hips and hamstrings were extremely tight and it got to the point where I could no longer complete my long runs. Not wanting to fall behind, I started Googling ways to combat injury while training for half marathons and “yoga” kept popping up. I found an online video that went through a basic yoga sequence. While following the video, I realized how tight I had become while training. Poses that used to come easy to me were extremely difficult. I was shocked! Determined to get my flexibility back, I began completing the yoga sequence every morning and every evening. One week later, I started running again and was able to get back on track before race day. The second time I trained for a half marathon, I was careful to avoid the trap I fell into the first time. I set myself up for success and found a training program that incorporated more cross-training opportunities. Next, I essentially replaced the phrase “cross-train” with yoga on my training schedule. I followed the same running regimen and increased my mileage each week, but was able to practice yoga a lot more! It was amazing how my body responded to frequent yoga; I felt stronger and more flexible than I did while training for my first half marathon. I was rarely sore and did not experience any injuries while training. While training for my second half marathon, I used yoga to help hold me accountable for stretching. I would schedule my long runs to be on days that Refresh offered a Stretch and Refresh class. I would end my long run in Old Town, eat a protein bar, hydrate, and then stretch out in class! Being in class ensured that I would take the time required to stretch effectively and evenly. Plus it felt great! For those of you who know me, I am and will continue to be a yoga enthusiast and runner. I love practicing yoga and enjoy running outside (weather permitting). (I am also known for, on occasion, running to 6:15 AM yoga at Refresh.) 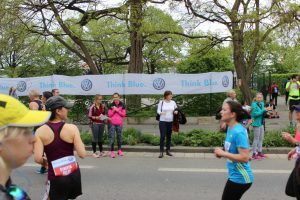 Training for a half marathon with and without yoga helped me to realize and fully appreciate that yoga is a fantastic complement for runners. It aids in developing muscular strength, flexibility, and balance. Yoga can reduce the risk of injury and also helps to improve mental focus and breathing efficiency. Having a hard time fitting yoga into your training schedule? You can get a lot of the benefits at home by incorporating basic poses into your weekly routine. My favorite stretches after a long run are downward dog, pyramid pose, low lunge, toes pose, reclined pigeon, reclined spinal twist, and legs up the wall! When practicing these poses at home be sure to focus on form, remember to breathe, and hold for at least 30 seconds. Downward Dog: Helps to stretch hamstrings, calves, and foot arches; strengthens shoulders. Toes Pose Helps to prevent plantar fasciitis by stretching the shins and arches of the feet. This pose is best done with shoes off! When practicing this pose, I kneel on my mat with my toes curled under. Then, I sit back on my heels and hold for 10 seconds. Then, I point my toes, place my hands on the mat behind you, and lean back, and lift my knees off the mat. If your knees don’t come up that far, don’t worry! You’ll still feel a great stretch in your shins and arches.